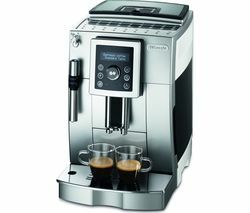 Delonghi is one of the top coffee machine brands. Delonghi coffee machines are for people who take their coffee seriously and who won’t settle for instant. With a Delonghi coffee machine you get great tasting coffee that’s easy to prepare. If you’re as passionate about coffee as you are about saving time and money, a Delonghi coffee machine can deliver coffee shop quality coffee at a fraction of the price, all from the comfort of your own kitchen. Whether you like to wake up with an espresso or end the day with a cappuccino, there’s a Delonghi coffee machine that’s perfect for you. The Delonghi Magnifica S ECAM 22.360.S is a state-of-the-art, professional-style, bean-to-cup coffee machine that has an impressive tank capacity of 1.8 litres, so you won’t go short when you’re entertaining friends or family. It will allow you to create espressos, lattes and cappuccinos the way you like them, and you can choose to use either ground coffee or coffee beans to make the perfect cup every time. 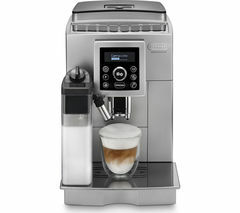 The hassle free auto cappuccino function will quickly serve up the perfect cappuccino at the touch of a button. If you want to impress guests or take your morning coffee routine to the next level, a Delonghi coffee machine is the ideal option.